Our Team This is Why We Rock! We at InterCoastal Net Designs have been helping our clients in making their websites ADA compliant. 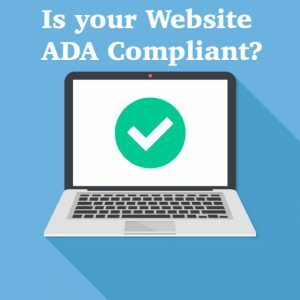 We have been asked recently why a website must be ADA compliant, so we thought we would share some of the information with you and how it helps your company out. What Does ADA Stand For? The ADA is the American with Disabilities Act and it requires that businesses and nonprofit service providers make accessibility accommodations to the disabled public. This means that they have to provide the same service to the disabled as they would for the non-disabled which includes their websites. What Could Happen If We Don’t Make our Site ADA Compliant? If your site is not ADA Compliant there are a few things that could happen. The first thing that could happen to your business is you could lose a client or a booking. We don’t want this to happen because the disabled person may go to another site that is ADA compliant. Another thing that we could see in the future is where Google and other search engines would only rank websites that are compliant. We know that they have recently moved in the direction to “force” businesses to make their sites mobile friendly or they will lose the rankings altogether. This could be the future with having your website ADA compliant and if it’s not then you lose your rankings. We don’t want this to happen to your business which is why we can help make your website ADA compliant. How Do We Make Your Website ADA Compliant? There are many suggestions on the ADA Website, but we know that there are many other considerations as well. We will take the precautions in checking your site to see if it’s compliant and if it is not, then we will make it compliant. There are several things that have to be addressed in making it compliant, but we will cover a few of the items for you. Your website will have information and user interface components that must be presentable to users in ways they can perceive. This ensures that the content on your site is available to view in multiple forms that will be easy to see or hear regardless of the disability. We will make sure to place an alt text tag on an image. We will make sure that the user interface components and navigation must be operable meaning that a disabled user can easily navigate your website. We want to make sure that they won’t run into any limited functionality or time limits if we make it compliant for them. We want to make sure the disabled can navigate through your site using only their keyboard or that the web pages are titled with a topic. Is It Easy to Understand? Having a website that is easy to understand is something that the ADA looks at. We want to make sure that your website and its pages are easy to read, are predictable and have the capability to correct user mistakes. We want your website navigation to remain consistent throughout the site and that you provide instructions for all user impute fields. Also, we want to make sure that a user is able to confirm their financial transaction before they submit it for an order or booking. The ADA wants to make sure that the content is robust enough that it can be interpreted by a wide variety of users including assistive technologies. This will help ensure that the compatibility between your website and current and future technologies that someone may use to assist them. We will make sure that your HTML documents include a start and end tags and do not contain duplicates. We want to help make their experience as good as it would be if it was non-ADA Compliant. While there are many other ways that InterCoastal Net Designs can help with making your website ADA Compliant, these are just a few of the examples we do for you. We understand that while this can seem very complicated to get onto your site, it’s something that we know how to do. We hope that you will trust InterCoastal Net Designs in helping build your business and making your website ADA Compliant for the new year! Author InterCoastal Net Designs StaffPosted on November 26, 2018 November 26, 2018 Categories Industry NewsTags ADA Compliant, Industry News, InterCoastal Net Designs, Website ADA CompliantLeave a comment on Is your Website ADA Compliant? Copyright © 2017 InterCoastal Net Designs. All Rights Reserved.